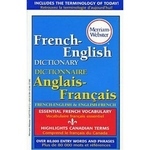 This dictionary is able to be use to translate words from English to French or French to English. This is a compact reference to the Japanese language for students and business professionals, covering the words most widely used in written and spoken Japanese. It includes Romanised Japanese and standard kana and kanji characters. 'The Merriam-Webster Thesaurus' offers over 157,000 synonyms, antonyms, related and contrasted words and idioms, all alphabetically organised with brief definitions of shared meanings. This bilingual, bidirectional dictionary is designed to help users communicate effectively in Spanish and American English and includes 5,000 new translations and hundreds of new words added. 80,000 entry words.